During the late 1800s until the early 1920s this property along the with the adjoining 227 Bourbon Street was used by the Chas W. Stumpf Piano Co. LTD. Charles Stumpf was a cornet player and band leader in New Orleans. The musical legacy continured into the 1930s when Leon Prima (1907--1985) operated the Shim Sham Club here. A September, 1935 advertisement for the Shim Sham Club announced "Opening Tonight -- Louis Prima and his New Orleans Five Orchestra Direct from the Famous Door in New York at Prima's Shim-Sham Club for Five Days Only featuring the Kind of Music that made him the Toast of Broadway -- Shim-Sham Review...Dimples Dalton, Princess of Blues...Shim-Shamettes, Beauty Chorus...Barron and Lynne". Louis Prima was Leon's older brother. 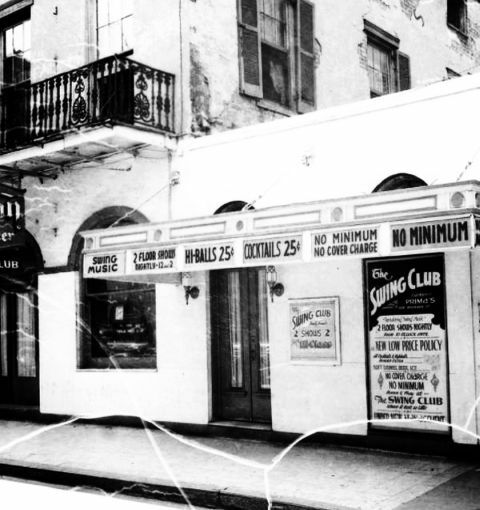 By the late 1930s the building became the Swing Club -- a detail of the larger sign out front includes "Formerly Prima's...Tantalizing Swing Music...New Low Price Policy...No Cover Charge...No Miniumum...Under New Management" these 1938 photographs. The smaller sign included "Proudly Presents 2 Shows Featuring Hi-Class Entertainment"(shared caption) Courtesy of the LSU Digital Library. Leon Prima was a trained pianist who became a trumpet player and band leader. As a young man Leon played with early jazz greats Leon Roppolo, Ray Bauduc, Jack Teagarden in New Orleans as well as with Peck Kelley's Bad Boys in Texas. He led the Melody Masters in New Orleans during the late 1920s. From 1940--1946, Leon played with Louis' big band in New York. After returning to New Orleans, Leon headed his own combo until retiring from music in 1955. He also operated the 500 Club (441 Bourbon Street) whose house band was led by Sam Butera until 1954 when Butera joined Louis' band in Las Vegas. 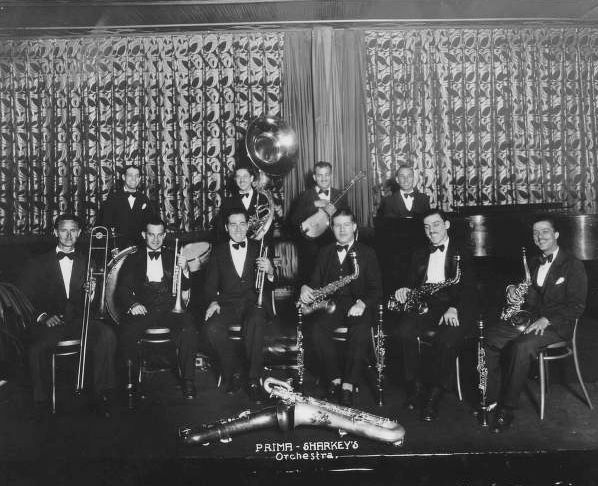 Pictured is the Prima-Skarkey Orchestra in 1930 at the at the Little Club in New Orleans -- Front row: Charlie Hartmann (trombone), Sharkey Bonano (trumpet), Leon Prima (trumpet), Irving "Fazzola" Prestnoptik (clarinet and sax), Dave Winstein (sax and clarinet), Nina Picone (sax); back row: Augie Schellang (drums), Louie Mass. Louis Leo Prima (1910--1978) Born in the French Quarter of Sicilian immigrants Angelina and Anthony Prima, Louis played at the Shim Sham Club four decades later. A violinist (until 15) turned trumpeter (when he picked up older brother Leon's horn) as a young man played with Irving Fazola, with his brother Leon's band, and in the house band at the Saenger Theater in New Orleans (1931). 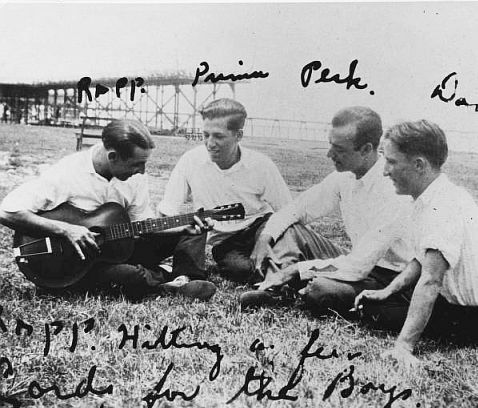 In this 1924 photograph (above we see (left to right) Leon Roppolo (playing the quitar), Louis Prima, Peck Kelly, Don (unknown). The Inscription reads: "Ropp hitting a few cords for the boys." The image was likely shot at the New Orleans lakefront. From the photo collection of Dr. Edmond Souchon. During 1930s Prima worked with Red Nichols, before forming a seven-piece jazz band called "Louis Prima's New Orleans Gang" which he formed in New York City in 1934 where he played with fellow New Orleans musicians Eddie Miller (tenor sax and clarinet) and George Brunies (trombone). Prima composed "Sing Sing Sing" (now in the Grammy Hall of Fame) in 1936 before it became one of Benny Goodman's most popular swing era tune. Twenty years later Prima recorded "Jump, Jive and Wail" (1956). 1950s with New Orleans saxophonist Sam Butera and the Witnesses (beginning 1954) and a 16 year old Keely Smith (later his fourth wife). Hits included "Just a Gigolo - I Ain't Got Nobody (1956)," "Buona Sera," (1956) "Black Magic (1958)," "Zooma, Zooma," "When You're Smilin',"
Louis died in New Orleans August 24, 1978 -- brain tumor. buried in Metairie Cemetery -- tomb statue of Gabriel, the trumpeter-angel. inscribed "When the end comes, I know, they'll all say 'just a gigolo' as life goes on without me..."
Louis Prima's name is imortalized in streets named for him in New Orleans East and Covington. 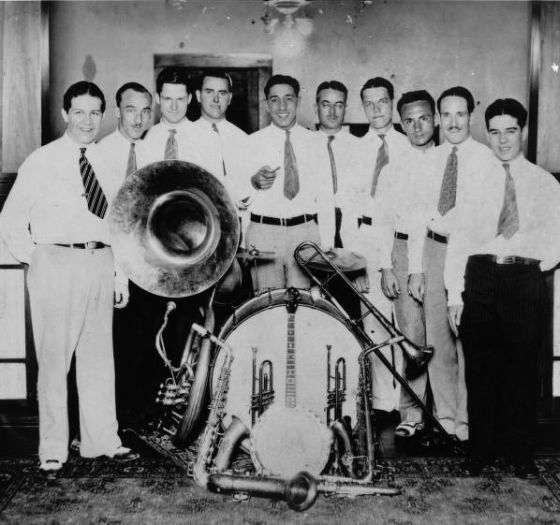 Pictured is Louis Prima's band in 1927 which included (left to right) Irving Fazola (clarinet/sax), John Miller (piano), Bob Jeffers (bass), George Hartman (trumpet), Louis Prima (trumpet), Cliff LeBlanc (trombone), Leonart Albersted (banjo), Jacob Sciambra (clarient/sax), Burt Andrus (clarinet/sax), John Vivano (drums). During the 1990s Ian Hardcastle, sole owner and shareholder of Bourbon Street Gospel and Blues, inc. and 227 Bourbon Street, Inc., owned the property from 227 through 235 Bourbon Street and sublet it for use as a jazz club. By the turn of the century, Bourbon Street Entertainmen operated Utopia music club at this location where lighted trees and fountatins grace the large courtyard. The company also owned the Jazz Parlor (125 Bourbon Street), the Ragin' Rooster (228 Bourbon Street), and partially owned Howl at the Moon (135 Bourbon). The building at 229 Bourbon Street later housed the Boogie Woogie, Club Utopia and Rhythms music clubs. As of this writing It is now Jazz Gumbo gift shop.